Today Rep. Gabrielle Gifford's chief of staff Pia Carusone gave the most forthcoming update yet on her medical state. As the tidbits fed to the media have suggested, she's doing remarkably well — for someone who suffered such a devastating injury. However, Carusone's comments seem to confirm that as we suspected, it's incredibly unlikely that she'll be able to run for office in 2012. "She is borrowing upon other ways of communicating. Her words are back more and more now, but she's still using facial expressions as a way to express. Pointing. Gesturing. Add it all together, and she's able to express the basics of what she wants or needs. But, when it comes to a bigger and more complex thought that requires words, that's where she's had the trouble." Since she can't fully communicate, it's hard to assess her mental state, but it's believed that her comprehension is "close to normal, if not normal." She's required to file paper to run of office by May 2012, and since she's only beginning to consider releasing a photo of herself, it seems unlikely that she'll be ready to face the press and endure the pressures of campaigning by that time. Not to mention that there's a good chance she isn't even interested in resuming her political career. "She's living. She's alive. But if she were to plateau today, and this was as far as she gets, it would not be nearly the quality of life she had before ...There's no comparison. All that we can hope for is that she won't plateau today and that she'll keep going and that when she does plateau, it will be at a place far away from here." 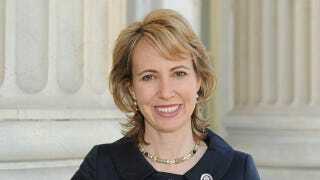 Earlier: Have Reports On Gabrielle Giffords Been Too Optimistic?